Wish I was gonna be in Sarasota on Saturday, November 24. 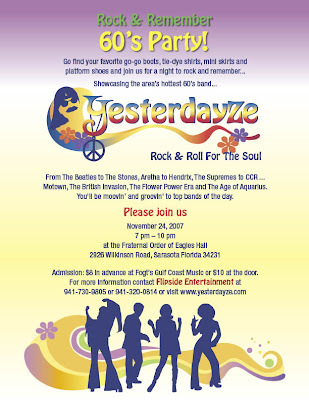 The groovy 60's band called Yesterdayze will be rockin' it out at the Eagles Hall, 2926 Wilkinson Road, 7 - 10 p.m. Buy your tickets in advance for $8 either at Fogt's Gulf Coast Music or online. Otherwise, $10 at the door. The band has a good buzz going for them and from what I hear, can really get the crowd moving and grooving. Hope I can catch them in March when I make it back down to Sarasota.